A child dies every six seconds because of hunger. That’s five million children each year. Approximately one billion people go hungry every day while there are roughly one billion obese people in the world. 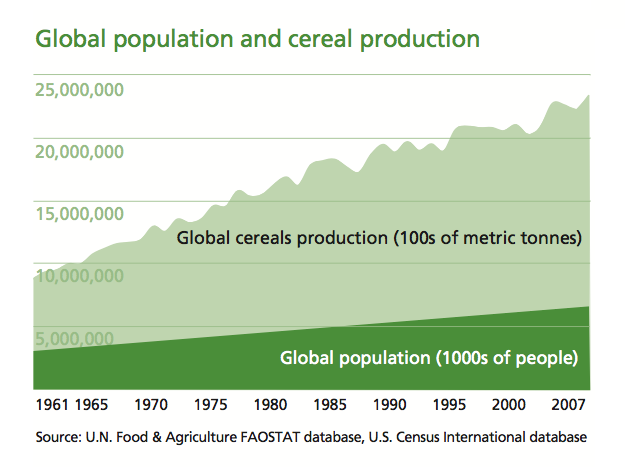 Increases in food production have been higher than population increases in the last 20 years. Yet poverty and hunger have increased. We produce enough food to feed all of the people in the world. Yet, since 2006 there has been a sharp increase in the price of staple food making it unaffordable for millions. It is estimated that because of this 15 million people will join the 70 million already living in extreme poverty. As a result, there has been widespread unrest erupting in riots over hunger, such as Mexico (January 2007) and Haiti (April 2008). Ireland is increasingly dependant on imported food, to the point that in the case of an oil shock, the country would “probably not even have food supply for a week”. (Irish Independent 26-07-08). This dependency makes Ireland vulnerable to unexpected events (such as volcanoes erupting in neighbouring countries) while at the same time reinforcing an unfair and unsustainable trade system. There are many issues behind this food crisis such as: rises in oil prices, food speculation, economies focusing on cash crops to the detriment of edibles, biofuel production and unfair trade practices. Many of these causes are linked to market liberalisation and Neoliberalism which has led to crises in other aspects of society too. Groups representing landless and peasant farmers, trade unions, environmental NGO’s, indigenous orgnisations and other civil society actors in Latin America have begun to mobilise and to present alternatives. LASC’s decision to focus on Food Sovereignty for their current 3 year plan and Ecofondo’s Food Sovereignty, Security and Autonomy campaign are supporting and particpating in this movement. Learn more about Food Sovereignty and LASC’s work in that area here.